When her daughter was born nearly four months premature, Deanna Fei confronted a shattering question: Had she delivered a child or lost one? Over months in the hospital, as she held the hand of a tiny baby fighting for her life inside a glass box, she came to grips with parenthood at its most elemental. Then, a year after she brought her daughter home, the CEO of her husband's company publicly blamed the medical bills of the beautiful, now-thriving little girl for a cut in employee benefits and attached a price tag to her life, setting off a national firestorm. 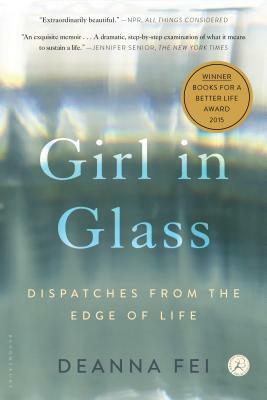 Girl in Glass is the riveting story of one child's harrowing journey and a mother's impassioned defense of human worth against corporate disregard. With luminous prose and an unflinching eye, Fei explores what it means to save a life: from the front lines of a neonatal intensive care unit to the perils of the American health-care system; from decades of medical innovation to the question of how we care for our most vulnerable; and finally, to the potent force of a child's will to live. Above all, Girl in Glass is a testament to how love takes hold when a new life defies all expectations. Deanna Fei is the author of the award-winning novel A Thread of Sky. A graduate of the Iowa Writers' Workshop, Fei has received a Fulbright Grant and a New York Foundation for the Arts fellowship. Her essays have appeared in the New York Times, Time, Fortune, and Slate. She lives in Brooklyn with her husband and two children. For photos, videos, and more, please visit deannafei.com.